Hands up if you love The Breakfast Club! 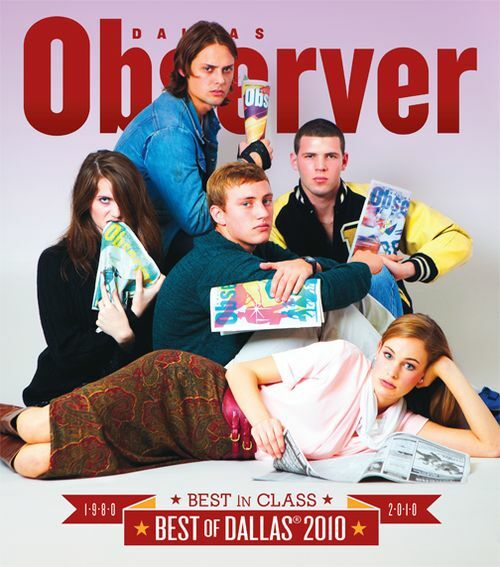 The Dallas Observer’s annual Best Of issue used the brat pack classic as the foundation for this year’s edition. Brother Steve and new Sister Brittany along with a fantastic client, several Wallflowers and two of the greatest assistants ever transformed The Breakfast Club into the Best Of Club and brought the whole thing back to life. 1 Oct Filed under Covers, Current Affairs, Editorials. Tagged Dallas Observer. Bookmark the permalink. ← Older: Party PARTY PAR-TAY! Happy Birthday to SISTERBROTHER MGMT!